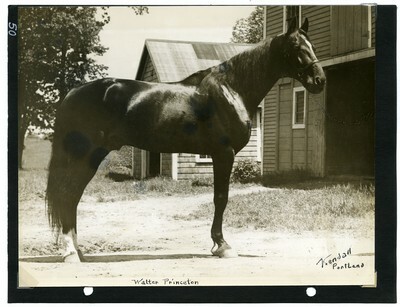 Portrait of black stallion Walter Princeton in an unknown location in 1936. Within his photo album collection, Kendall placed the image adjacent to a set of images taken at Topsham Fair in October 1936. The photo is signed in the lower right corner by photographer Guy Kendall.